Evidence of Nharangga people’s day to day lives can be found in the form of old campsites. While most of the sites are found along the coast, many more lie inland, typically around small salt lagoons and lakes. Unfortunately not all of the materials used and eaten have survived the wind, rain and sun over the years and the various wooden implements and vegetable remains have long since rotted away. These sites can, however, tell us much about the food they ate, the places they preferred to live in and travel to, and the activities that occupied their lives. It is thought that the Nharangga maintained large settlements along the coast throughout much of the year. It is here that most of the permanent sources of freshwater can be found and the range of foods were both plentiful and varied. The elderly, the sick and the very young would stay in these camps while others would return each day or so, bringing back various foods they had collected or hunted, wood they had cut or stone they had acquired for tool making. Campfires would be lit, and wurlies of brush wood and mallee would be built. People would walk to a nearby rock hole or soak to collect water, fashion various wooden or stone tools or repair fishing nets. Some of the main settlements included Moonta Bay, Cape Elizabeth, Chinaman’s Well, Point Pearce, Black Point, Point Yorke, Brown’s Beach, Tiddy Widdy and Port Moorowie, to name a few. Other sites were lived in for only short periods of time, perhaps while people were moving from one large camp to another or where they stopped overnight while collecting food. A small fire might be lit at the end of the day and some of the shells, fish or animals would be eaten. The rest would be taken back to the larger camps and shared with other people or perhaps stored to be eaten later. These small camps are the most common site type found and occur everywhere about the coast. The seasons probably had some influence on their movements. During the winter months for instance, when the small swamps and clay pans found throughout the peninsula filled with water, people could travel away from the coast and spend more time inland, hunting game and collecting vegetable foods from the thick mallee forests. At other times of the year, people would gather to exploit the fish ‘runs’. Stone tools were used for a variety of tasks and are the most common item found in campsites. Hammers, scrapers, chisels, knives and spear tips were all manufactured from stone. Some of these would be attached to wooden shafts using plant resin or gum while others were used to grind seed for making damper and cake or perhaps to prepare ochre for ceremony. Bone was occasionally fashioned into tools, with long, sharpened pieces used as leather punches and cloak pins. Tools were manufactured from various types of stone, including quartz, chert, quartzite, silcrete and flint. Many of these materials can be found as cobbles along beaches while others occur at specific locations around the peninsula. Others are likely to have come from outside the peninsula and their presence within campsites illustrates trade between the Nharangga and their neighbours. 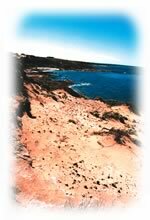 The chert quarry at Pine Point was perhaps the most significant stone quarry on the peninsula and the chert obtained from here can be found in many campsites throughout the region. Its fine-grained nature meant that flakes could be accurately shaped and the edges were sharp and hard. 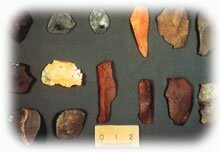 Indeed, this material was so prized that it was not only traded between Nharangga people, but outside their country as well, and Pine Point chert can be found as far a-field as Adelaide and beyond. Shell remains are the next most common item found within campsites, Warrener, periwinkle and abalone are often found. These were not only eaten but the shells were also used for scraping animal skins, or made into ornaments and jewellery. Other common foods included emu meat and eggs, fish, kangaroo, possum, lizard, bandicoot, bettong, crab, crayfish and wombat. Wooden clubs. The curved one is from Chinaman’s Well. Burials have been found at many locations on the peninsula and in particular within the sand hills that line much of the coast. Usually only the harder bones and teeth remain and become exposed by the action of the wind blowing away the covering sands. While many burials have been located in shallow graves, they have also been noted in small caves such as Corny Point. People were occasionally buried with some personal items such as a shell necklace or trinket while ochre is also often found and may relate to ceremonies undertaken during the funeral or decoration of the body. Whilst we can only guess the age of most of the campsites on the peninsula, two have been radiocarbon dated. The first, a burial at Troubridge Hill, was found to be over 500 years old. The second is a campfire at Port Moorowie. This was found to be about 900 years old. It is possible however that some sites will be much older than this, possible several thousand years old or more. The map shows the locations of some campsites, stone quarries and freshwater sources known to exist on Yorke Peninsula. These probably represent only a small fraction of the actual number and many more remain to be recorded. These sites can contain stone tools, food remains, old fire places and occasionally burials. Some can extend for hundreds of metres and contain thousands of artefacts. Others are small in area with only a few artefacts and shells. These are the locations from which particular types of stone were quarried. Quartz and chert were collected from these quarries and shaped into various tools. Ochre was used as decoration and can be found at several locations. These include rock holes, wells and soaks. The rock holes vary in size and were often covered with a stone slab or perhaps brush wood.